Home » Architect » Architecture » Building » cement » Civil » concrete » Construction » Engineering » House » measurement » mortar » plane construction » report » Roofing » sand » surveying » test » Why is Bitumen Used in Road Construction? Ashalt, bitumen and tar are referred as bituminous materials, which are essentially hydrocarbon materials.The asphalt is a mixture of inert mineral matter lime alumina, lime, silica etc. and a hydrocarbon known as asphaltic bitumen. In some places like Trinidad and Bermudez, asphalt is available in nature at a depth of 3 to 60 metres. It is known as natural asphalt. 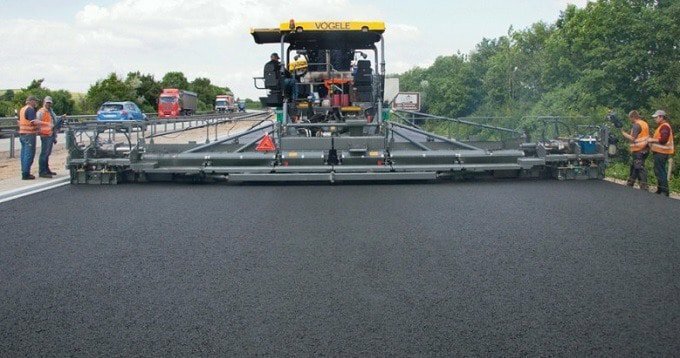 Bitumen is used in road construction due to various properties and advantages it has over other pavement construction materials. Advantages of bitumen for road construction is discussed. Common variety used all over the world is residual asphalt, which is obtained by fractional distillation of crude petroleum oil. Bitumen is the binding material which is present in asphalt. It is a hydrocarbon. It is obtained by partial distillation of crude oil. It contains 87 per cent carbon, 11 per cent hydrogen and 2 per cent oxygen.Tar is obtained in the distructive distillation of coal, wood or other organic materials. When coal or wood is heated to redness in an closed chamber, it yields volatile product and residue coke. After separating and cooling volatile product gives tar. To go with a wide variety of circumstances, a wide variety of bituminous mixtures were developed. The main variation is brought by the change in the bitumen content, the bitumen grade, the aggregate type used and the size of the aggregates. 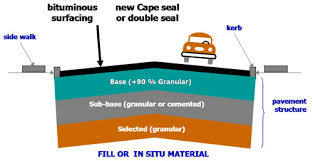 Traditionally in UK, the bitumen is categorized into two. The first one is “asphalt” and the second one is “macadam“. In North America, the asphalt is called as bitumen itself. Asphalts are bitumen mixture whose strength and stiffness is gained through the mortar property. While in the case of macadam, the strength is dependent on the aggregates that are used in the mix (i.e. grading of the aggregates). For each case mentioned, the property of the bitumen change. It is found that the asphalt properties are more governed by the bitumen properties than in the case of macadam. The hydrocarbons and its derivatives formed in a complex colloidal system will compose to form the bitumen structure. Bitumen is a colloidal system that dissolves in trichloroethylene. This solvent is used to determine the constituents that are present in the bitumen. The colloidal system of bitumen is a system with solid particles of Asphaltenes, that together form a cluster of molecules or these can be micelles; a continuum of Maltenes. Based on the micelles dispersion, the bitumen can either exist in the form of a sol or in the form of a gel. Sol is formed when there is complete dispersal. The gel is formed when the micelles undergo flocculation to become flakes. The bitumen take a gel character, when it has a higher quantity of saturated oil of molecular weight less. That bitumen with aromatic oils show sol character. This is one with more Asphaltenes. The individual fractions that form a bitumen surely have some contribution towards the properties of the bitumen material. The Asphaltenes is the fraction that shapes body for the material. The resin in the bitumen contributes to adhesiveness and ductility of the material. The viscosity and the rheology of the material are taken care by the oils present in the bitumen material. The stiffness of the material is governed by the sulfur that is present in significant amounts mainly in high molecular weighed fractions. The presence of a certain complex of oxygen will affect the acidity of the bitumen. The acidity of the bitumen is a factor whose determination will help in knowing the adhering capability of the bitumen with the aggregate particles. 0 Response to "Why is Bitumen Used in Road Construction? "